Brightly colored Easter-themed wood puzzles are a great opportunity for young kids to learn their colors in English and Spanish. Wood Puzzle Easter Colors is a high quality app that contains a good number of puzzles with high educational and entertainment values, all at a great price. Tropisound’s Wood Puzzle Easter Colors offers a unique way for children to learn their colors in two languages, English and Spanish, while completing brightly colored wood puzzles. The straightforward interface makes the app easy to use for even the youngest users; the cheery colors, nice music and sounds create an enjoyable atmosphere for fun and learning. The app contains 15 different puzzles with Easter eggs, bunnies, jelly beans and flowers; all are brightly colored. Choose any of the 15 to play; users are not required to complete one before moving onto the next. Puzzles can be as easy or difficult as you choose. Thanks to the pieces snapping easily into place as they near the proper location and a “Baby Mode”, younger children can complete the puzzles without becoming too frustrated. Baby Mode is an autocomplete type option that allows the child to move the pieces or watch as the puzzle is completed for them. This mode includes cheery background music. To bump up the level of difficulty you can use the rotation option. This option requires the user to think a little harder while placing the pieces, as rotation may be needed. 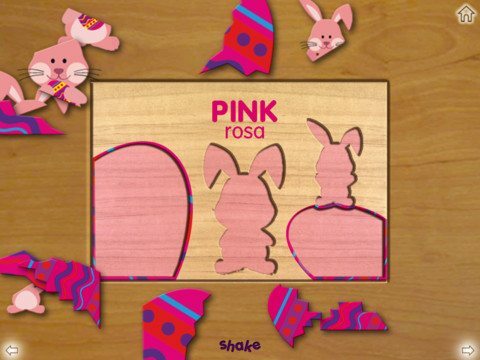 Wood Puzzle Easter Colors is a positive learning experience; not only is the design bright and cheery, but the app provides positive feedback throughout. While learning the colors in both languages is a bonus, the option to turn off one or the other language is helpful to parents wanting to focus on one specific language. Preschoolers, toddlers and other youngsters will enjoy completing the puzzles in this app. The atmosphere is warm and inviting, fun without a lot of bells and whistles. The number of puzzles and options to control the difficulty in this app will appeal to parents as it extends the life of the app to grow with their children’s abilities. The price is also appealing for this high quality app that is well designed for the targeted audience. Being an iPad only app doesn’t detract from the value rating; an iPhone version is also available. Wood Puzzle Easter Colors is nicely designed for the young users it is intended for. They will easily pick up on what is required to complete the puzzles. Links for additional apps are tucked away under a menu making it unlikely kids will access them. Protecting this menu to restrict the children from accessing it would be ideal.